Side A: Detail of the gods Eros (Love), Himeros (Desire) and Peitho (Persuasion) from a painting depicting the love of Aphrodite and Phaon. Eros is depicted as a winged child riding a pair of deer. 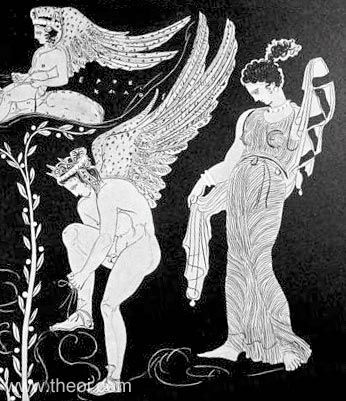 Below him, the winged youth Himeros ties his sandal. On the right, Peitho draws her cloak in a seductive pose. Side B: The gods of Delos (see other image). This is a drawing of the vase rather than a photograph.